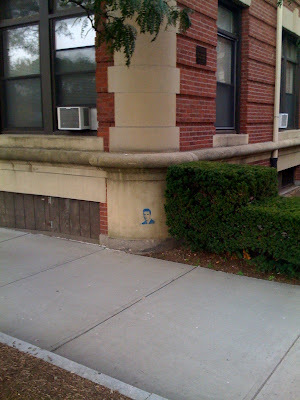 Here's a banksy-esque graffiti stencil my brother Patrick pointed out to me by the corner of Harvard and Stearns near Coolidge Corner, just a block away from me. 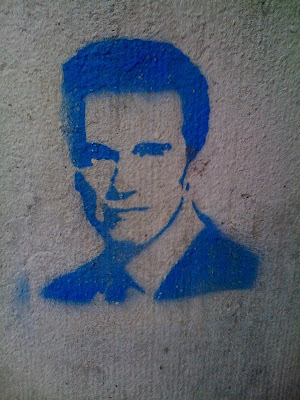 I loved it, not only because I'm a huge Arnold fan, but also because it's been there for a while and it hasn't been painted over or sandblasted yet. And it questions whether the authorities haven't noticed it and so it hasn't been removed or if people notice it, but don't mention to have it removed because they don't mind it or even like it as an unexpected little nugget of street art. It's nice to know Arny (it's what Maria and I call him sometimes) is watching over us way over here on the east coast as well.